Outside your room temptation awaits. Adventure, activities & pure relaxation is all on the agenda at Castaways Resort & Spa Mission Beach. You’ll be tempted to just lie by the hotel’s pool and enjoy the ocean view, but Mission Beach offers so much more. In the evening, clink minty mojitos and zingy margaritas into the wee hours at Bibesia Beach Club for beachside bliss. 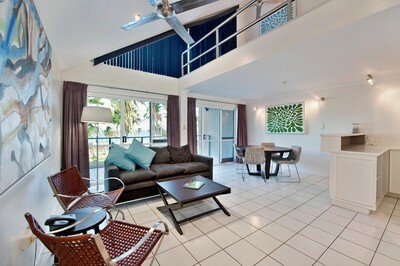 Castaways Mission Beach accommodation is your ultimate beachfront escape in the tropics. Idyllically bound by the Great Barrier Reef and World Heritage Wet Tropics Rainforest, our resort is the perfect destination for couples, families or groups of friends. Positioned absolute beachfront with direct access to the 14 km long beautiful, white sandy beach you have found your own tropical little paradise right here! Castaways Resort & Spa offers a wide range of accommodation, with 47 luxury Beachfront rooms and self-contained apartments, a private Beachside Villa, 18 lush Rainforest rooms and a Luxury 3 Bedroom Apartment spread over three centrally-located properties. Reception open from 7.00am - 7.00pm 7 days a week. Arrivals after 7.00pm must go to Restaurant for Check In. Arrivals after 9.00pm must dial 9 from Foyer Guest Telephone for assistance. Flying in to Cairns Airport - Located 135km south of Cairns International Airport, Castaways Resort & Spa, Mission Beach is accessible by Airport Transfers with Exemplar Transport or Coach Transfers from Cairns CBD with Greyhound & Premier Coach Companies. Flying in to Townsville Airport - Located 223km north of Townsville, Castaways Resort & Spa, Mission Beach is accessible by Coach Transfers with Pioneer Coaches from Townsville CBD. Car Hire is available from both Cairns and Townsville Airports and car hire companies include East Coast Car Rentals, Avis, Budget, Europcar. Perfect for escaping couples, singles or small family wanting to getaway for a few days and immerse themselves in the great outdoors to relax or seek adventure, but still have a relaxing room to call home. 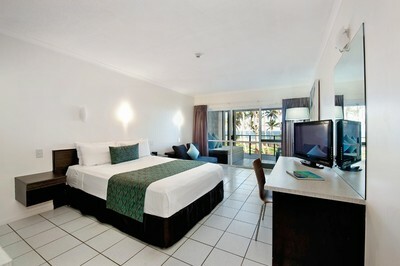 Resort Rooms are configured with a Queen Size dream bed and one single bed. 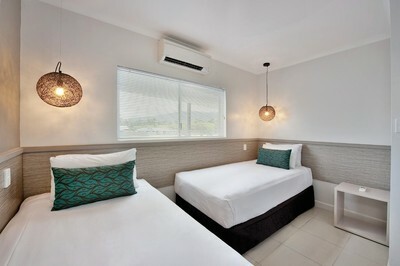 All rooms are beachfront and offer stunning uninterrupted views of the Coral Sea, Dunk Island and The Family Group of islands from your private balcony or patio garden. Maximum of 3 adults. Rent your own beach house absolute beachfront! 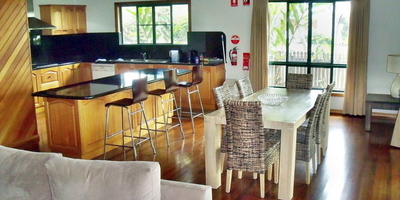 This is a 3 bedroom, fully self-contained holiday home with a plunge pool on the large veranda and direct beach access. Enjoy the privacy of a full home but with the extra luxuries of the facilities a resort can provide as you have full access to resort facilities. 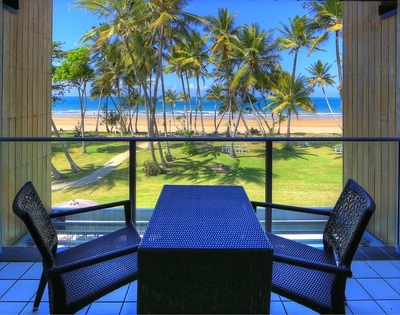 This absolute beachfront villa is situated not just on the edge of the Coral Sea but on the edge of Mission Beach Village. Stroll along the beach and in minutes you reach the village with shops and cafes. 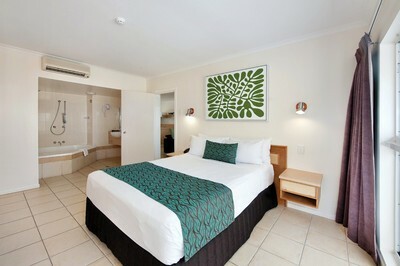 Ideal for the active family, the Family Resort rooms feature two separate rooms. The main room serves as a living and main bedroom with a queen size bed & stunning views of the Coral Sea from the private balcony. The second bedroom has two single beds � great for the kids! Spacious bathroom with shower over bath. 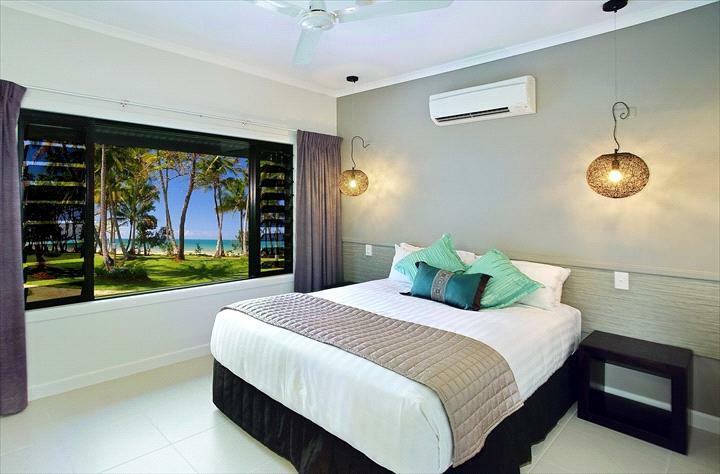 All rooms are beachfront & feature bi-folding doors that open the whole main room to a private balcony or garden patio with views of the beach through coconut palms, Coral Sea and Dunk Island. The Island Suite offers a spacious loft style room with absolute beachfront views from the very peak of the resort and a private balcony. Bedroom with a queen size and spa bath is found on the Mezzanine level. On the entry floor you find a large bathroom, lounge & dining area along with kitchenette.